Examples would be great – as @CrystalGipsy mentioned, this is an area we’re actively working on now, so we’d love to hear what’s not working in the current search, so we can make sure the changes we’re working on better address these cases. Thanks for the feedback here @midi – we’re on it! Elias (the right one) wasn´t found. If I search the Album (“Warcry”) it appears. It seems not very difficult, to find the problems of the ROON search in reality. If it were simple it would be sorted. I would have thought that was obvious. From what I gather the changes are starting from a new base rather than trying to fix an old and broken model. As with most big changes in Roon I have no doubt patience is needed. If it isn’t what you need look in every few months. Ask and we’ll tell you what has changed if anything. Roon has obviously still problems with the search engine. Search Fink albums. A lot of them are missing in Roon, but they appear in Tidal. When your are searching the albums by name, they will appear in Roon. I have tried to search for the Fink albums available on TIDAL but not available on Roon and I could not locate any, can you please share some screenshots of examples? Thanks for sharing that screenshot. 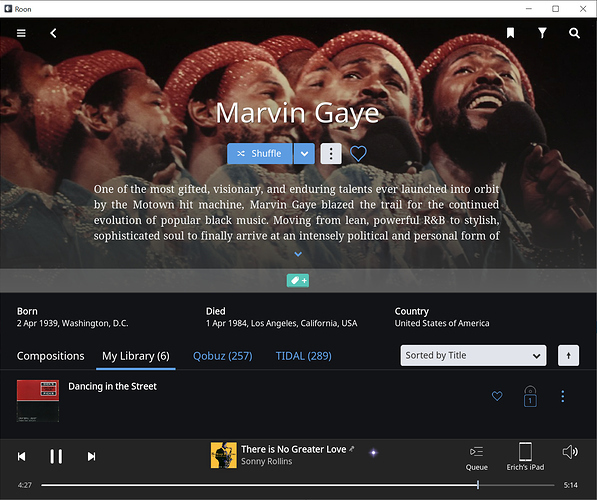 While the same content should be available in Roon and TIDAL, in Roon you’re going to see Roon metadata, so the presentation isn’t always going to be the same. Our team does a lot of work to separate multiple artists with the same name, and this process usually yields in a much more accurate artist representation. 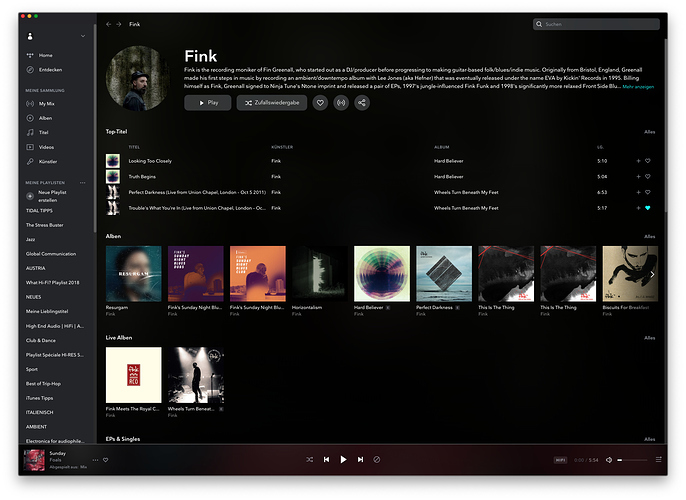 Roon improves on this, and understands that multiple artists have the same name, assigning the correct albums to each artist. It’s possible that something like that is happening here, or perhaps the logic that makes these decisions hasn’t worked as expected here. I noticed that in your screenshot, most of the albums are appearing on the Roon side of things, but the “Breakfast For Biscuits” album is absent. Is that the distinction you’re asking about, or something else? Are you using a US based Roon account? This album shows up as expected for me, but if you let me know where your TIDAL account is based I can look into What’s going on here. I think FINK isn’t a multiple artist. But anyway, there were a lot of problems f.e. with MOBY, obviously in the meantime they were solved. It happened often, that I have to search albums on Tidal, put them in a Tidal playlist to see them in ROON and put them from this playlist in my ROON library. I have done that with FINK/wheels turn beneath my feet the last time. I thought you solved the problem with you last search engine modification, but obviously there are still problems. I am using a German TIDAL account. And I am based in Germany. It happened often, that I have to search albums on Tidal, put them in a Tidal playlist to see them in ROON and put them from this playlist in my ROON library. I have done that with FINK/wheels turn beneath my feet the last time. On my end, this album appears as expected. The next time you experience this issue, can you share some screenshots of what you’re seeing before adding them via the playlist as you mention above? We can take a look at the specific example so we can better understand what you’re experiencing here. Searching Marvin Gaye, the album You´re the Man. 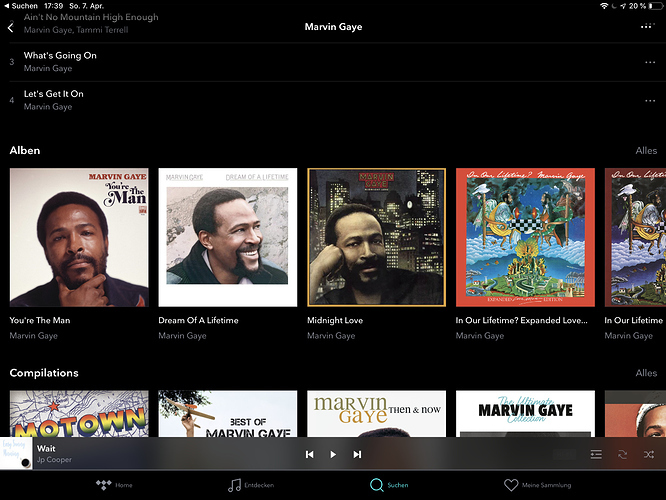 Not listed in ROON but in TIDAL, when searching Marvin Gaye/albums. Did you add this to your favorites in TIDAL? 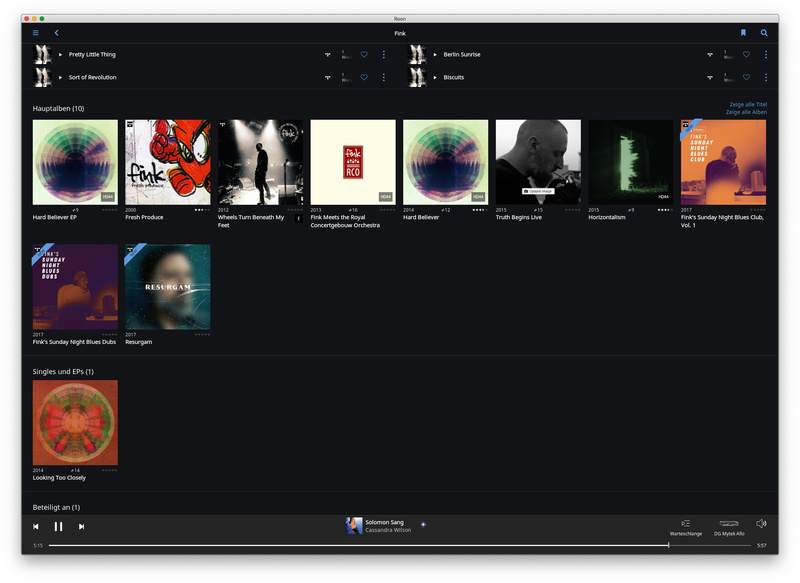 If it’s in your favorites, in should show under the Main Albums in your library. If it’s not in your favorites, it should show under the TIDAL section. No, the album You´re The Man is not in my favorites. I got 39 albums, including 1 in my library/Tidal and 2 only in my library. The album You´re The Man is missing. I get 55 albums with both ways, including the album “You´re the Man”. For me the difference seems to be not very logical. Perhaps you can explain it. 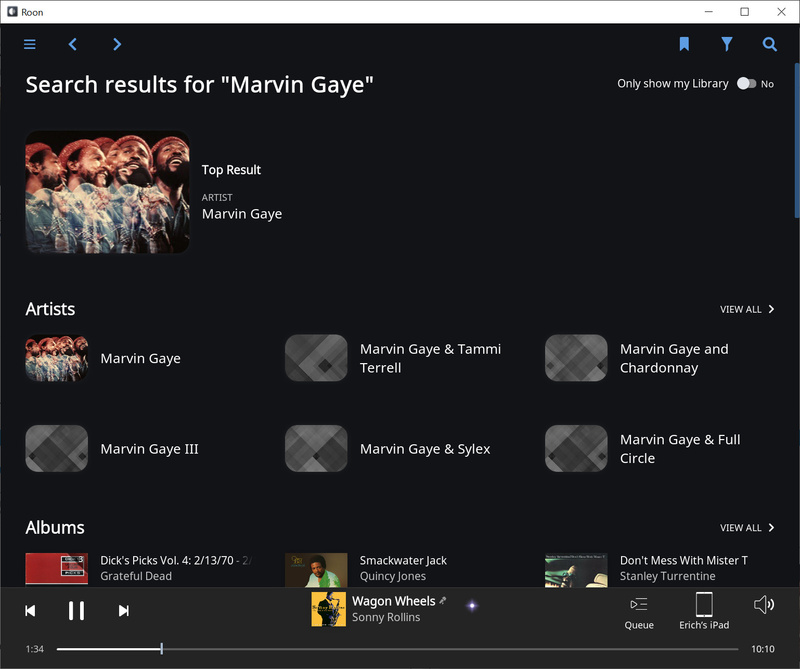 I see from the screenshot you’ve shared that you’re looking at the search results screen, which is a little different than viewing all Marvin Gaye albums directly. When you search for Marvin Gaye, our goal is to make sure you can always find what you’re looking for. 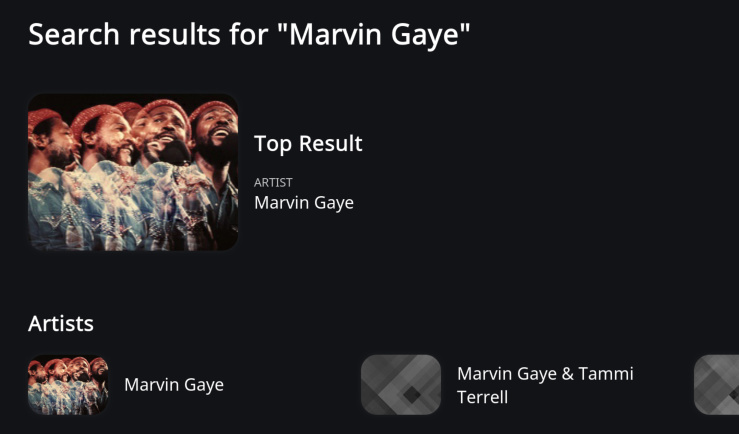 Obviously, in most cases people are looking for the artist Marvin Gaye, and a link to his page should generally be the top result, or the first artist result. We’ll also give you some other options, like the most popular Marvin Gaye albums or tracks, or albums from other artists that include the words “Marvin Gaye” in the title. The results are broad by design. We need to ensure you have access to Buddy Holly the artist, and Buddy Holly the Weezer song. 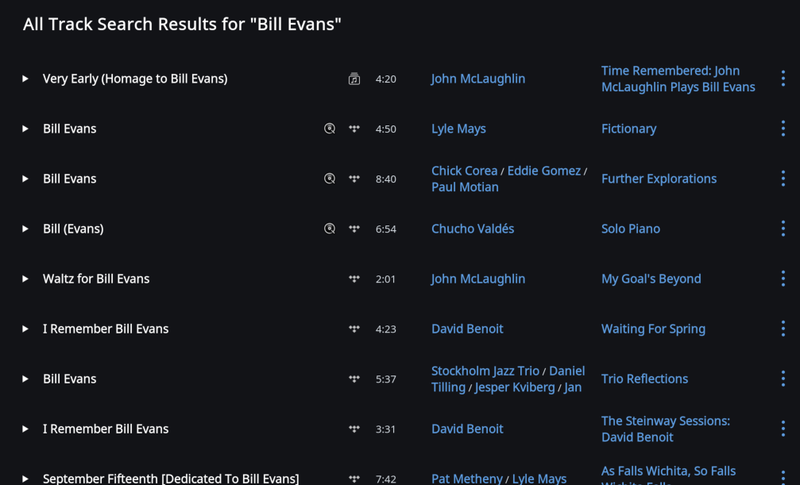 You need to be able to find the artist Bill Evans, and the hundreds of songs named after him. 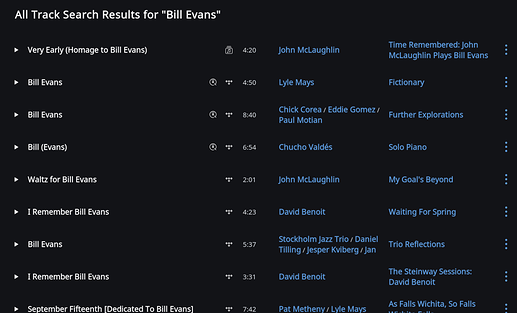 And that wouldn’t necessarily be possible if 1000s of Bill Evans recordings were showing up. The goal here isn’t to display a list of every album by a single artist – that’s what the artist’s page is for. 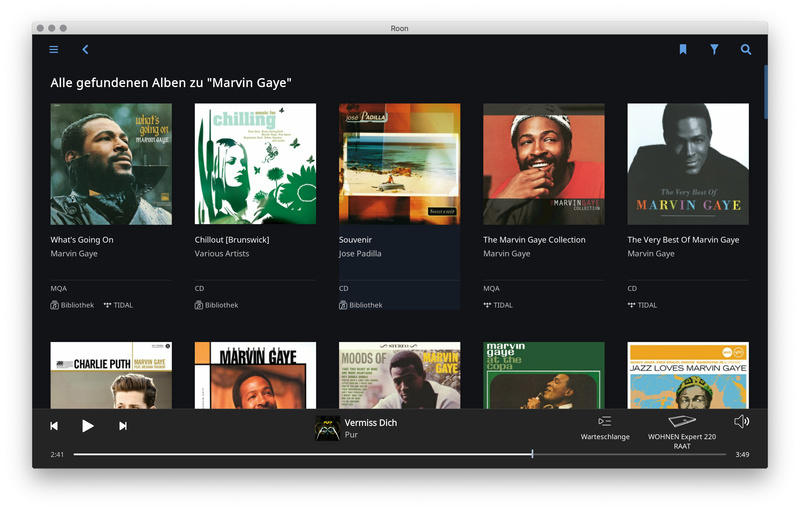 On their page all available albums will be displayed, whether in your library or on TIDAL or Qobuz. Hope that helps explain the design here. We’re always working to make our search results the best they can be, so we really appreciate your feedback here, Midi. Sorry, perhaps me English is too bad, but I don´t understand the logic behind your search engine. 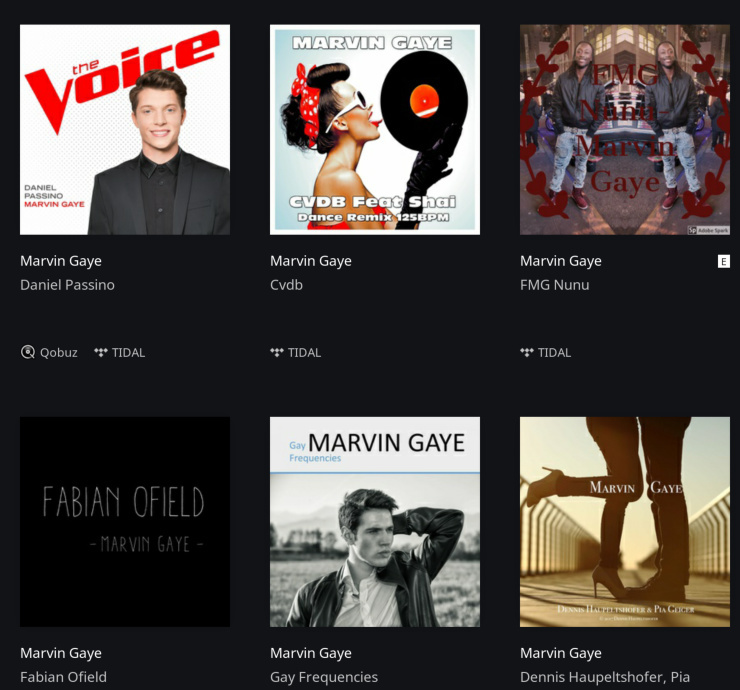 When I search for “Marvin Gaye” I want to see “all albums” from Marvin Gaye - but I can see only 40 albums ! But when I search “Marvin Gaye” and klick on “main albums” I get 55 (!) albums. So whatever you want to tell me - I don´t understand this. “all albums” means for me “all” not only 40 albums. “main albums” means for me “main” - but I get more “main” albums (55) than “all” albums (40) - that´s pretty illogical - I think not only for me. This isn’t how search is designed to work. As Dylan mentioned, we need to make sure you can find what you’re looking for no matter what. If you search for “Marvin Gaye” chances are you are looking for Marvin Gaye’s music, which is why all of his content is a single click away at the top item on the page. 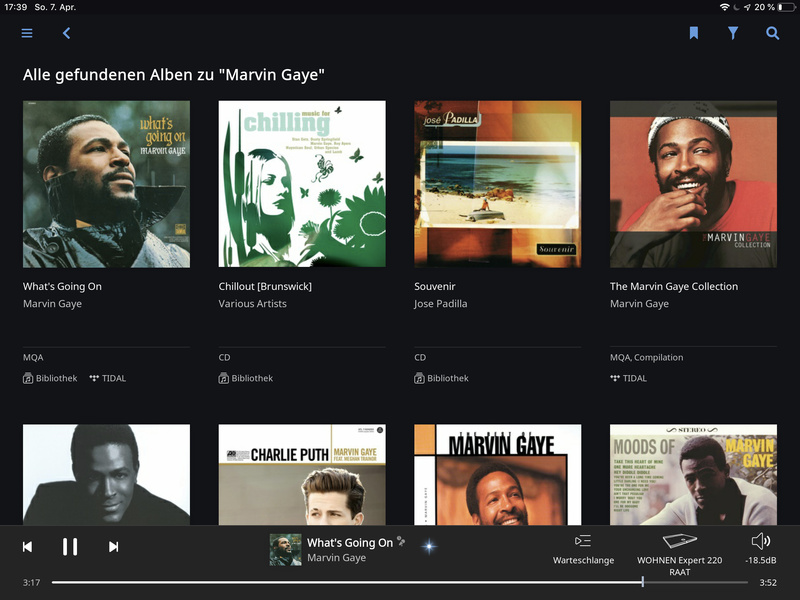 If you’re looking for Marvin Gaye, all his recordings are a click away. We appreciate feedback like this, and you should feel free to open a feature request if you’d like a change here – if you think we can make it easier to find Marvin Gaye, we’re definitely interested, but trying to squeeze every recording into search results probably doesn’t make sense when you consider the wide variety of content users may be searching for.